Add pre-wetting and anti-icing capabilities to your snow and ice control operations in St. Peters with the PWS-100 pre-wet system from SnowEx. Compatible with the SnowEx SP-1875, SP-3000, SP-6000 and SP-7550 spreaders, this pre-wet system can save both time and money as it activates the salt before it hits the spinner, providing increased material efficiency and better material control. The 30 gallon capacity of the PWS-100 makes it perfect for smaller pre-wetting applications. 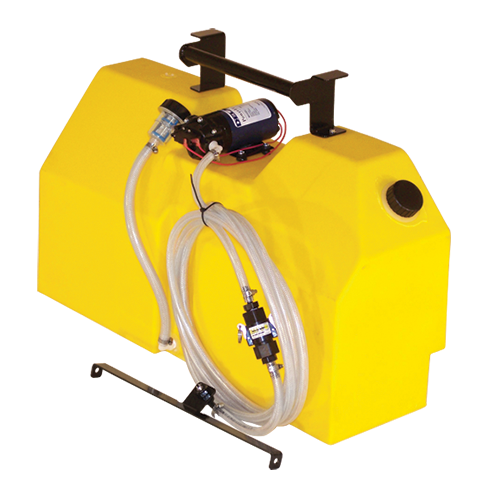 A cab-mounted control provides an on/off switch for controlling the pre-wetting sprayer.